Advances in behavioral sciences are giving us an ever better understanding of how our brains work, why we make the choices we do, and what it takes for us to be at our best. But it has not always been easy to see how to apply these insights in the real world--until now. Caroline Webb is a management consultant and executive coach who has spent fifteen years at McKinsey and at her own firm, Sevenshift, showing clients how to use behavioral science to boost their professional effectiveness. An Oxford- and Cambridge-trained economist, Webb and her work have been featured in the Financial Times, New York Times, Washington Post, The Economist, Forbes, and on the BBC. She divides her time between New York and London. "Behavioral science has come of age in recent years, and it has begged for a world-class translator. Now we have one. Caroline Webb’s peerless translation of the behavioral sciences into tools for shaping the quality of our day is the book we’ve been waiting for. Play with just 2% of the ideas in this book, and you might just end up changing your life's course. Words like 'magisterial' come to mind. Bravo." “Finally, a practical book based on evidence. 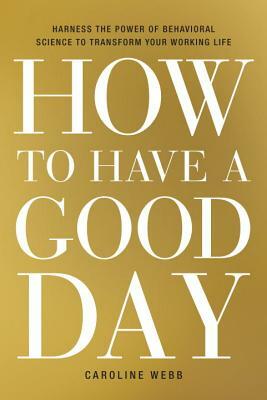 How to Have a Good Day is grounded in state-of-the-art research on behavior and neuroscience, and animated with vivid examples from professionals who have successfully applied Webb’s advice. It might even leave you looking forward to your next tricky conversation or challenging task as an opportunity to try out her tips." "Almost all of us work in environments where our time is stretched far too thin. How to Have a Good Day helps us rise to that challenge, containing ideas and techniques that show us how to be at our own personal and professional best every day." "Webb has given us a great gift: she has synthesized all the advice coming out of labs around the world, filtered it for quality, and illustrated it with well-chosen examples. The appendices alone will save you dozens of hours per year — particularly on email — and help you create more great days for yourself. This is the only self-improvement book you will need in the next five years." "There's a big difference between having a great, productive day and having a bland, ordinary one. Caroline Webb deftly explains how to squeeze the most out of twenty-four hours, to create more of the former. Very useful." "Imagine what your life would be like if you could simply 'choose' to have a good day. Webb makes a powerful case that we can. Best of all, she shows us how. Webb gets her arms around the vast body of information coming at us from behavioral economics, psychology, and neuroscience, and distills the best of it into the kind of practical advice a wise friend might offer. It's the book Daniel Kahneman might write if he'd been working in the business world for twenty years. Masterful." "This is a brilliantly useful book. Caroline Webb has a quite exceptional range of organisational experience. She uses it to review a vast span of the latest academic 'thinking about thinking' in the clearest possible way. And then she applies this wisdom to help us all sort out the frazzle of our own working day. Her approach is utterly straightforward but based in deep insights into how human beings really behave." “Years ago I was a rower, and in sport everyone knows you need to pay attention to yourself, your intent and your mindset, to be at your best. This book reminded me of all I learned from those days about the importance of having the right attitude. I found it a great, practical guide to applying these and other helpful psychological insights in business – something we do all too infrequently. Built solidly on the latest research, brought to life with storytelling, it offers many simple ways to boost your performance and give you a better day at work – and if you’re a leader, it will show you how to make sure that your colleagues are on top form, too." "How to Have a Good Day speaks to every area of your workday and shows how making a few critical adjustments to your everyday behavior will leave you amazed by the results. By applying the lessons in Webb's book, all based on science, you’ll maximize your performance and be more energized than ever." “In How to Have a Good Day, Caroline Webb offers practical advice rooted in the latest science and psychology for anyone who wants to take a more intentional approach to life and enjoy the greater productivity and success that comes from doing so. If you want to stop reacting to your life and start living it, this book will get you moving in the right direction."